Looking For A Fun Way To Have Your Next Birthday? 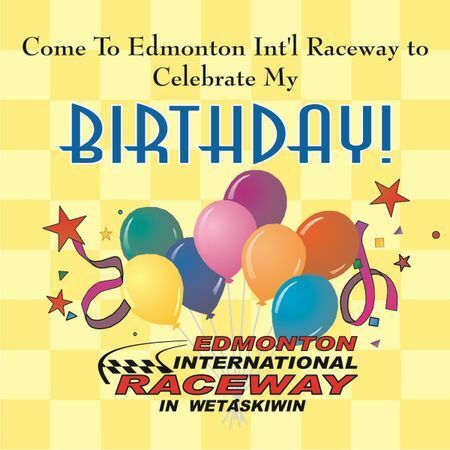 Edmonton Int'l Raceway can organize your child's Birthday Party, no matter what age! This is an extremely popular way for children to celebrate their birthday. All of our birthday parties are held on the Saturday nights that we race. Our Race Season schedule is early May to early October each year. On a Saturday Night Birthday Party we ask that you come about 3:30 pm. You will sign in and pay at the Front Gate and then be directed to our Party Tent where the kids will have their dinner. Close to 5 pm the kids will then go for their birthday ride and have their photo taken. Our race program begins at 5:30 pm. You would then enjoy the show. You can choose to have your cake right after your meal or ask to have it at Intermission (typically around 7 pm). The Birthday Child is presented with a trophy engraved with "Happy Birthday from Edmonton Int'l Raceway"
Cost: $20 per child (plus GST) - a minimum of 6 party guests is required - no limit on maximum number of guests!